Please come if you can, no. 2. 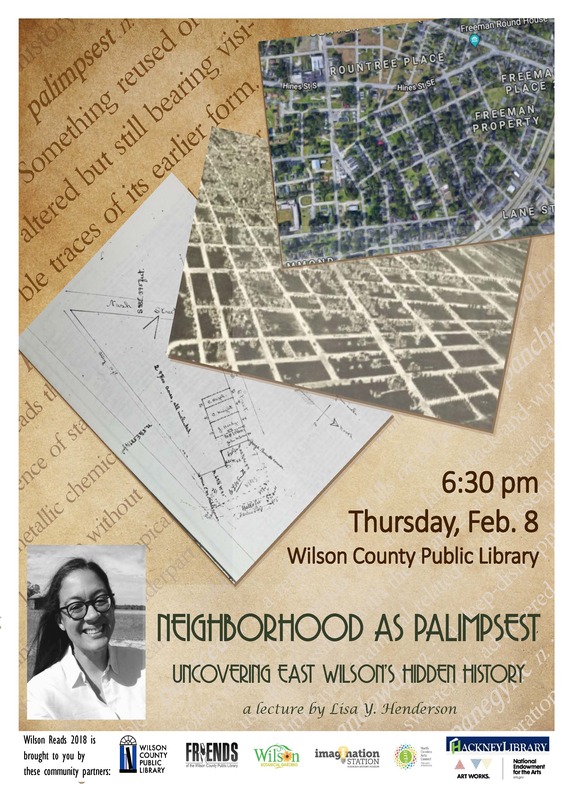 Our wires crossed a bit, and I will not actually be speaking on “Neighborhood as Palimpsest,” but come on out anyway, because I will be talking about the development of Wilson’s African-American neighborhoods in response to the city’s burgeoning tobacco industry. ← 616 East Green Street. I would love to speak to Ms Lisa Henderson, it was by accident that I found yhe information on my grand mother and grand father, myrtie and Butler Jones i am the okdest daughter of Willard (Bill) and Sallie Jones. They are both deceased. I realky enjoyed reading about them and other family members. Hello, this is Lisa Henderson. I’m so glad you found my blogposts and took the time to comment. I’ve enjoyed learning so much about Wilson families and sharing that information.